For a limited time, you can trade with Admiral Markets live account and get up to 50% bonus on your deposit. 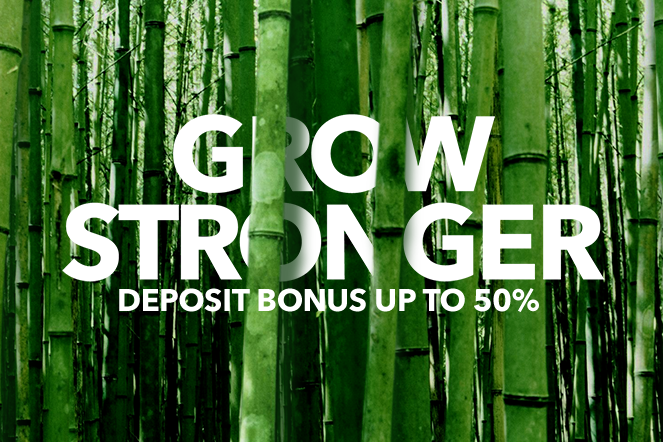 From 1 April 2016 to 31 May 2016, our new Grow Stronger campaign rewards you for depositing more. The higher your trading deposit, the bigger your account balance bonus and the more chance you have to strengthen your trading potential. Market-leading trading conditions: Spreads from 0 pips, leverage up to 1:500, orders from 0.01 lots, lightning-fast execution, no dealing desk and over 100 trading instruments. Secured funds: Admiral Markets UK Ltd is regulated by the United Kingdom's Financial Conduct Authority and you can help ensure you don't go in the red with our negative balance protection policy. Personalised treatment: Admiral Markets puts you first with a personalised account manager, top class education tools, 24/5 live support and outstanding promotional campaigns all year round. For more information on our Grow Stronger campaign, please visit the campaign page or contact our sales team directly.